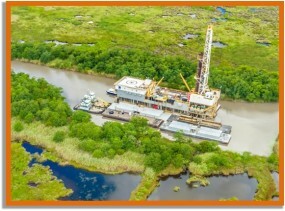 Seidler Oil & Gas is pleased to announce participation in the Bodacious #4A Prospect in St. Charles Parish, Louisiana. Bodacious #4A is an 12,000’ TVD directional well and is normal-pressured, with two target objectives Upper and Lower CIB OP Sands. The CIB OP sands are a field pay productive horizons that trap stratigraphically in the nearby field area wells. Bodacious #4A turned to sales April 2019. As of April 21st 2019 Bodacious #4A is producing 3.4 MCFPD 241 BOPD.